Legazpi City–To be able to finalize and fine tune K to12 learning materials, the Local Climate Change Adaptation for Development (LCCAD), the Office of the President – Climate Change Commission (CCC) and the Department of Education (DepEd) Region V will host a two-day convergence on the rewriting, reediting and fine tuning of the K to 12 learning materials on April 26-27, 2016 at SarungBanggui Beach Resort in Sto. Domingo, Albay. One hundred and eight official high caliber selected teachers coming from the cities of Legazpi, Tabaco and Ligao and numerous facilitators from DepEd and other project partners will take part in the endeavor. The selected teachers are divided into two groups: writers and critics. Several partner organizations will also be in attendance to oversee the crafting of the K to 12 learning materials. 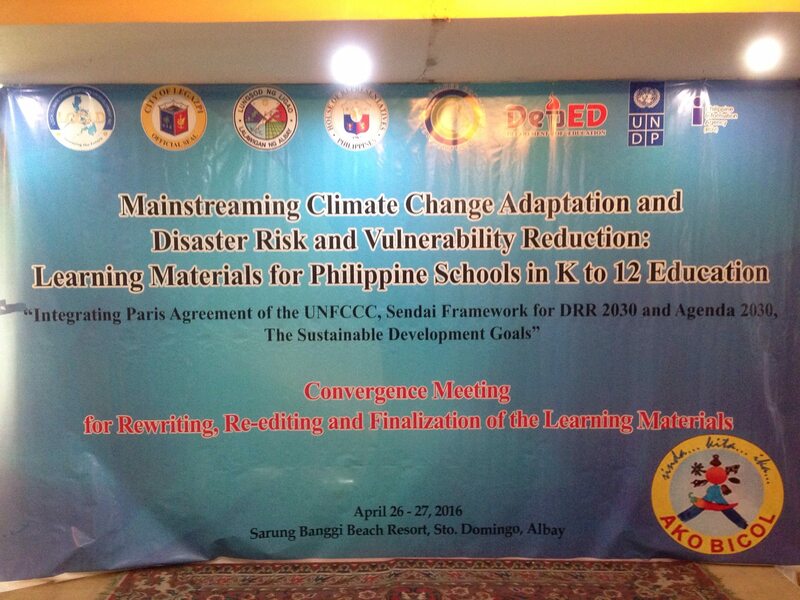 The project, “K to 12 Mainstreaming Climate Change Adaptation (CCA), Disaster Risk and Vulnerability Reduction (DRVR): Learning Materials for Philippine Schools”, aims to incorporate CCA and DRVR in the K to 12 curriculum subjects.CCC Secretary Emmanuel de Guzman said earlier this year that the project will be a nationwide campaign and the pilot testing will be situated in Bicol Region or the “Vatican of CCA and DRVR”. According to LCCAD Executive Director Manuel ‘Nong’ C. Rangasa, the undertaking was an offshoot of a memorandum of agreement (MOA) between the LCCAD and CCC.This MOA also recognized LCCAD as the main capacity development service provider for CCA-DRVR convergence to local government units (LGUs) in the country. “The crafting of the K to 12 learning materials is a brain draining activity,” Rangasa expressed. Director Rangasa, who was recently designated by Secretary De Guzman of CCC as the Official Focal Person to the Department of Interior and Local Government (DILG), Climate Change Committees on Senate and House of Representatives, Leagues of Governors, Mayors and Barangay Captains in the Philippines, added that the teachers are challenged in this project and they are very vocal that they want to be part of this endeavor as it is the first of its kind in the country. The LCCAD Executive Director told that the project is the brainchild of Congressman Fernando Gonzalez, Albay third district representative. “As a brainchild of Gonzalez, the project concept is anchored securely on the commonly accepted fact that measures to address climate change and disaster impacts start at home where families and individuals are the basic elements of the day-to-day decision-making process”, Rangasa added. Educating the youth is an important element to incorporate CCA in the Philippine educational system according to Gonzalez. “Our schools can provide the venue for the adoption and implementation of the integrated global goals for resilience among vulnerable peoples, multiple stakeholders, and communities by preparing the populace, both socially and culturally, to meet the unequivocal challenges of climate change and natural disasters,” the congressman stated. During the writing and critiquing of the learning materials in the past few months, Rangasa said that the participating teachers and facilitators are motivated since the country and the youth will benefit from the production of the learning materials. He also mentioned that the teachers find it very challenging yet, they admitted on playing a vital role in imparting the CCA and DRVR to the students. They added that it is very important for the students to study and learn all these things in order for them to get ready to face the global problems on the impacts of climate change. Last February, the LCCAD hosted a three-day technical writeshop with the teacher-writers who are involved with the project.The constituted National Panel of Technical Experts (NPTE) in the scientific fields of environment and climate were present during the three-day drafting of learning materials. They were environment and ecology experts Rex Victor Cruz, Felino Lansigan, Rodel Lasco and Juan Pulhin; ecology and biodiversity experts Profirio Alexander Aliño and Laura David; earth science and environment specialists Carlos Primo David and Fernando Siringan; meteorologists Rosa Perez and Lourdes Tibig; climate change and earth scientist Leoncio Amadore; health science specialist Glen Roy Paraso, greenhouse gas emission inventory sector representative Leandro Buendia; and climate scientist Jose Ramon Villarin. Joining the National Panel of Technical Experts (NPTE) were CCC Sec. de Guzman, Albay 3rd district Representative Gonzalez, Legazpi City Mayor Noel E. Rosal, DepEd Undersecretary Rey Laguda, DepEd Bicol Regional Director Ramon Fiel Abcede, Office of the Civil Defense (OCD) V Regional Director Bernardo Rafaelito R. Alejandro IV who represented National Disaster Risk Reduction and Management Council (NDRRMC) Undersecretary Alexander Pama, and the United Nations Development Programme (UNDP) Senior Advisor Amelia “Baby” Supetran. The learning materials are projected and anticipated to be finished by the 3rd quarter of 2016 and be integrated to the curriculum as soon as possible. The project is fully supported by other partner organizations and LGUs such as the City Governments of Legazpi, Ligao and Tabaco, Senate and House of Representatives Special Committees on Climate Change, Ako Bicol Partylist, Philippine Information Agency (PIA) Region V and the UNDP.